The neighborhood of Monastiraki in central Athens is known for its bargain shopping, vibrant nightlife, and an array of historic ruins and monuments. The word “Monastiraki” means “little monastery,” and refers to the small monastery in Monastiraki Square. It’s all that remains of a once-great monastery in this area. A more modern house of worship, the Tsisdarakis Mosque, was built in 1759 during the Turkish occupation. Surrounding Monastiraki Square, there are narrow streets lined with shops of every variety. On Sundays, there is also a flea market off the main pedestrian avenue, where you’ll find antiques, furniture, jewelry, books and nearly everything else you can imagine. The remains of Hadrian’s Library are directly across the street from the Monastiraki Metro station, and both the Roman Agora and the Ancient Agora are also nearby. The Monastiraki Metro station is right on Monastiraki Square, and is served by two of Athens’ Metro lines. If you’re short on time and energy, cruise through Athens on an electric bike in just 3 hours. After being fitted with your bike, your private guide takes you past the city’s historic and modern sights. Stop whenever you like to ask questions or take photos. With the aid of your electric motor, cover several important areas of the city without getting worn out. Enjoy refreshing water or a bottle of beer at the end of your ride. Discover the vibrant, history-packed Greek capital at night, once the daytime crowds have thinned. On this unique, eco-friendly private tour, you’ll hop an electric tuk-tuk to cruise between eight different standout sites, with get-down stops at the Acropolis and Mount Lycabettus. Upgrade to include door-to-door pickup as well. Are you a gourmand? Don’t miss the chance to hit the foodie trail with your expert local guide by starting your tour at Syntagma Square, the beating heart of Athens’ nightlife. Admire the illuminated Greek Parliament followed by a scenic walk until you reach your first food stop; a contemporary deli shop with one-of-a-kind products and recipes, where you will indulge in a variety of Greek traditional flavors. Enjoy velvety fava with smoked sygklino ham from Mani, or hand-made pies with pastrami and graviera cheese. Wash down your tastings with traditional raki and learn the proper way to enjoy this beloved Greek spirit. 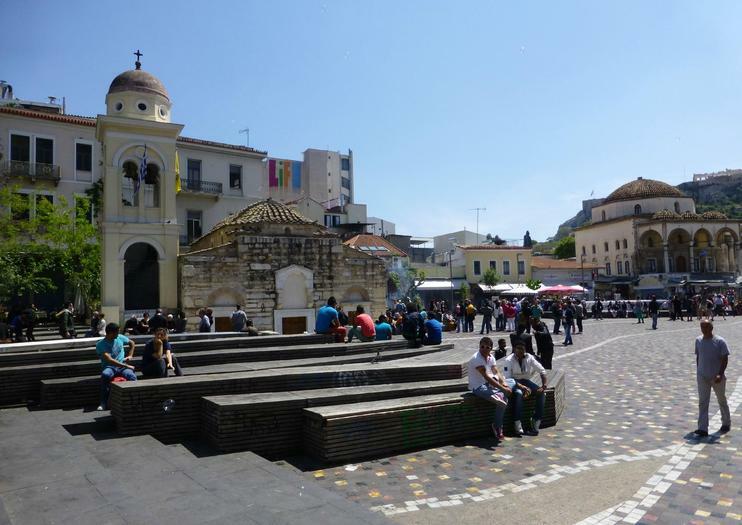 After warming up a bit, follow your guide to encounter the liveliness of Monastiraki Square, where you will learn why it truly reflects all the different historical eras of Greece. Experience the delights of eclectic Athens on a tour that includes bustling markets, ancient marvels and traditional coffeehouses. Explore the vibrant neighborhoods of Psiri and Kolonaki; browse the stalls at Monastiraki flea market and Athens Public Market; and admire ancient sites like Kerameikos Cemetery and the Temple of Hephaestus. Along the way, discover bold street art, foodie hotspots, handicrafts workshops and secret local hangouts. Discover many of Athens’ historical gems on this half-day tour. By combining a walking tour and a Trikke tour, you’ll cover more ground and enjoy two very different experiences. The walking part of the tour will take you to places near the Acropolis that can only be reached on foot. Your Trikke ride will help you explore the rest of Athens at a faster pace—highlights include the National Gardens, and Zappeion Hall. Athens’ Plaka and Monastiraki quarters are a must-see, but can be difficult to find your way around independently. This private walking tour provides the answer: with a guide to showcase their highlights and hidden corners. Stroll Monastiraki square and flea market; see the antiquities carved into the Acropolis’ slopes; and explore Plaka’s alleyways and Cycladic-style Anafiotika area, all as you hear history and secrets you’d otherwise miss. Go behind the scenes in Athens to taste authentic Greek cuisine on a 4-hour food and walking tour led by a knowledgeable guide. Experience daily life in the city as you visit a variety of eateries and discover culinary gems that are favorites of the locals. Enjoy more than 15 tastings that make up a generous meal and understand why Greece is famous for its delicious cuisine. You'll visit the Athens Central market, bakeries, traditional taverns and restaurants, and explore historical sites that few tourists see. Athens is known for both its ancient sites and its modern masterpieces. Explore the best of Athens on a private day tour. You’ll save time researching highlights by having a guide to shortlist and take you to the best bits. Your day will be enhanced with commentary along the way. Interesting attractions you’ll pass include Monastiraki Square, the Roman Agora, Hadrian’s Library, the Temple of Zeus, and Zappeion Hall. There’s so much to see in Athens and only so much time. Maximize your Greek vacation with a full-day private tour of the city. Starting from your hotel, you’ll have private transportation at your disposal whisking you away to multiple UNESCO World Heritage Sites, including the Acropolis. You can explore each location independently at your own pace or choose to hire a private guide in advance. It's your day.